In the spirit of full disclosure, I have to admit that I’ve been a big fan of the Metal Gear Solid franchise ever since the first time I saw the opening sequence from the first Metal Gear Solid. I was teenager, and I was blown away by how much it was like a movie. Ever since then, I’ve viewed the franchise as a paragon of (or at least a forerunner in) cinematic storytelling in video games. As such, the series isn’t without its convolutions, but I’ve followed the series through each of its iterations (excluding the MGS: Twin Snakes remake) and actually enjoyed each of them. That being said, I have to say that I kind of torn over Metal Gear Solid: Peace Walker. My grievance with the game lies almost entirely in the implementation of the boss battles. These battles, which involve fighting tanks, helicopters, or some kind of prototype robotic weapon, seem to have been balanced for cooperative play, but the difficulty doesn’t scale down when you take on these machines by yourself. I found some of these encounters to be really difficult for me to handle on my own, and if I wouldn’t have had access to an internet-connected PlayStation 3 to use adhocParty, I would probably have quit this game out of frustration. I can understand why Metal Gear Solid: Peace Walker could get away without internet connectivity in Japan, where the PSP is wildly popular and the population is much more dense, but I can’t abide by a game that essentially requires multiplayer omitting an over-the-internet mode in a North American release. In my opinion, it nearly breaks the game. Fortunately, there is a lot left over in Metal Gear Solid: Peace Walker that isn’t fighting unbalanced boss battles, and the rest of the game is fantastic. The sneaking missions are everything that I expect from a MGS game. The simple RPG elements from Metal Gear Solid: Portable Ops have been enhanced in the form of building a huge military in the middle of the Atlantic Ocean. As you capture and recruit enemy soldiers into the Militaires Sans Frontieres (a process that has been thankfully streamlined from Portable Ops), you assign your new soldiers to various tasks which earns you money that you can use to fund research for new gear and expanded facilities at the Mother Base. The whole game is divided up into bite-sized missions (if time were like a candy bar), and I found myself repeating the sneaking missions over and over again to achieve “S” rankings (for flying through the mission as fast as possible without being spotted or killing anyone) and recruiting better and better soldiers for my army. 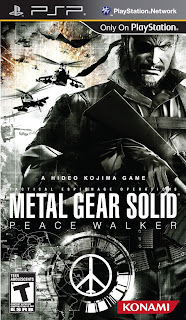 For me Metal Gear Solid: Peace Walker was a really addictive experience. Yet, every time that I encountered a mechanized boss, I found myself really wanting to put the game away, but I soldiered on, taking the time to power on the PS3 and try to find a stable group on adhocParty willing to help me through a mission or two so I could get back to what made the game so much fun: stealthily crawling through the South American jungle and silently eliminating enemy soldiers.